When we think of traveling to Arizona, the majesty of the Grand Canyon comes to mind, but Arizona has some other great canyons you can visit and some are hidden finds. Learn more about Arizona’s other spectacular canyons you can visit. 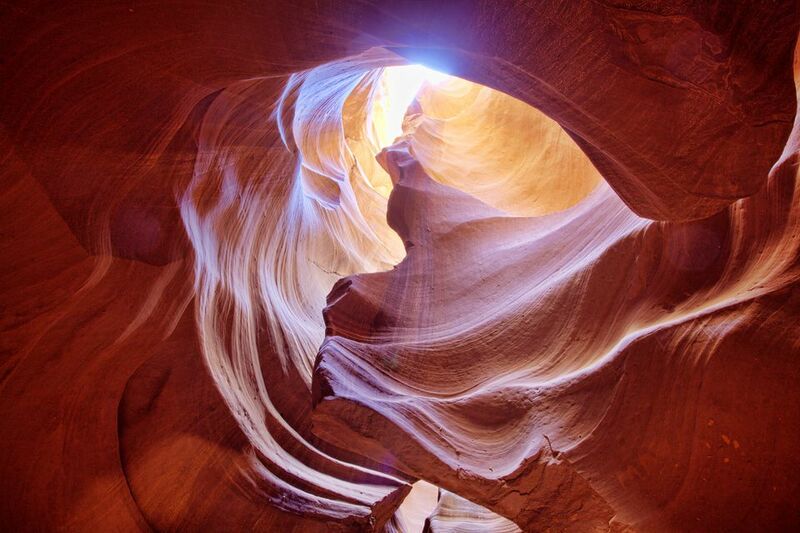 Antelope Canyon, located outside of Page is at once one of the most breathtaking and tranquil places on earth. Gently carved from the Navajo sandstone over the course of countless millenniums, the slot canyons are majestic and narrow passages, just enough space for a small group to walk the sandy floor and for the occasional shafts of sunlight to shine down from above. It is really two separate canyons: Upper and Lower Antelope. Each contains the hidden "slots" carved from the swirling sandstone, and both drain from the south into Lake Powell (once the Colorado River). Though dry most of the year, Antelope Canyon runs, and sometimes floods, with water after rains. It is the water, slowly wearing away the sandstone grain by grain, that has formed the beautiful and graceful curves in the rock. The wind has also played a role in sculpting this fantastic canyon. To access Upper and Lower Antelope Canyon, you must have an authorized guide. As the world’s most photographed slot canyon, Antelope Canyon tends to get a little overcrowded. Fortunately, there is an alternative: Canyon X, a slightly deeper, more remote and far less visited canyon than Antelope, lies just a few miles away. Because visits to Canyon X are limited to four people at a time (six if they're in the same group), photographers and hikers can enjoy the eerie beauty of a top-notch slot canyon in near isolation. Canyon X lies within the Navajo Reservation and is accessible only through Overland Canyon Tours in Page. The company offers a six-hour photographers tour, shorter treks for hikers and customized tours – all of which are only available through advanced reservations. For more information, visit the Overland Canyon Tours website. Just south of Flagstaff, State Rt. 89A descends a breathtaking series of switchbacks into a scenic, smaller cousin of the Grand Canyon. Known for colorful rocks and unique formations, Oak Creek Canyon is famous around the world around for its spectacular scenery. In fact, the Oak Creek Canyon-Sedona area is one of the most popular tourist destination in Arizona, second only to the Grand Canyon. Located within the Coconino National Forest, portions of Oak Creek Canyon have been designated federal wilderness areas as part of the Red Rock-Secret Mountain Wilderness. The United States Forest Service operates several campgrounds, picnic areas, and recreation areas within the canyon. Slide Rock State Park, home to a natural water slide and swimming holes, is also located within Oak Creek Canyon. Sunbathing, Fishing and hiking are other popular pastimes. In the densely-wooded country southeast of Flagstaff, the small seasonal stream Walnut Creek has carved a 600-foot deep canyon into the local Kaibab limestone as it flows east, eventually joining the Little Colorado River en route to the Grand Canyon. The exposed rocks in the canyon walls occur in various layers, of slightly differing hardness, some of which have eroded more rapidly forming shallow caves. During the 12th to 13th centuries, these caves were used by the local Sinagua Indians who constructed many cave-dwellings along the steep well-protected ledges, high above the canyon floor. Walnut Canyon was proclaimed a national monument in 1915. While there, hike one of two trails or stop and take in a program given by park rangers. Allow at least 2 hours to see the museum and ruins. (Find out more from The American Southwest and the National Park Service). Ramsey Canyon, located within the Upper San Pedro River Basin in southeastern Arizona, is renowned for its outstanding scenic beauty and the diversity of its plant and animal life. This diversity—including such highlights as the occurrence of up to 14 species of hummingbirds—is the result of a unique interplay of geology, biogeography, topography, and climate. Southeastern Arizona is an ecological crossroads, where the Sierra Madre of Mexico, the Rocky Mountains, and the Sonoran and Chihuahuan deserts all come together. The abrupt rise of mountains like the Huachucas from the surrounding arid grasslands creates “sky islands” harboring rare species and communities of plants and animals. This combination of factors gives Ramsey Canyon Preserve its tremendous variety of plant and animal life, including such southwestern specialties as the lemon lily, ridge-nosed rattlesnake, lesser long-nosed bat, elegant trogon, and berylline and white-eared hummingbirds. Nestled in Ramsey Canyon is the Arizona Folklore Preserve. Founded by Official State Balladeer Dolan Ellis and in partnership with the University of Arizona South, the Arizona Folklore Preserve is a place where Arizona's songs, legends, poetry, and myths are collected, presented for audiences of today, and preserved for the enrichment of future generations. Reflecting one of the longest continuously inhabited landscapes of North America, the cultural resources of Canyon de Chelly include distinctive architecture, artifacts, and rock imagery while exhibiting remarkable preservation integrity that provides outstanding opportunities for study and contemplation. Canyon de Chelly also sustains a living community of Navajo people, who are connected to a landscape of great historical and spiritual significance. Canyon de Chelly is unique among National Park service units, as it is comprised entirely of Navajo Tribal Trust Land that remains home to the canyon community. Horse-back riding, hiking, jeep tours and four-wheel drive tours are all available at Canyon de Chelly as well as ranger-conducted activities. As a prime example of the Southwest's desert country, narrow and twisting Aravaipa Canyon has few if any equals. Located 50 miles northeast of Tucson, It is a stretch of incredible scenic wonder, filled with biological treasures that have attracted enough human traffic to make overuse a problem since the 1960s. Aravaipa Creek, shaded by cottonwoods, has cut a trough up to 1,000 feet deep in the Galiuro Mountains, and the canyon walls are wondrously carved and painted in subtle sandy colors. The creek runs year-round from springs, seeps, and tributary streams, and along the water grows one of the lushest riparian habitats in southern Arizona. The main canyon's length is about 11 miles, and the Wilderness extends well beyond it to include surrounding tablelands and nine side canyons. Seven species of native desert trout may be found here, along with desert bighorn sheep, an extensive variety of large and small mammals and reptiles, and at least 238 species of birds. A “must do” in Aravaipa Canyon is the Bed & Breakfast, Across the Creek at Aravaipa. Because the inn is 3 miles up a gravel road and then across a stream (high-clearance vehicles recommended), it's a long way to a restaurant. Consequently, innkeeper Carol Steele provides all meals. Guests entertain themselves hiking in the Aravaipa Canyon Wilderness, bird-watching and cooling off in the creek. The casitas are eclectically decorated with a mix of folk art and rustic Mexican furnishings and have tile floors, stone-walled showers, and shady verandas.